From now until the end of August, 2017, anglers will be heading to the Columbia and Snake Rivers in hopes of catching northern pikeminnow and earning big bucks too. 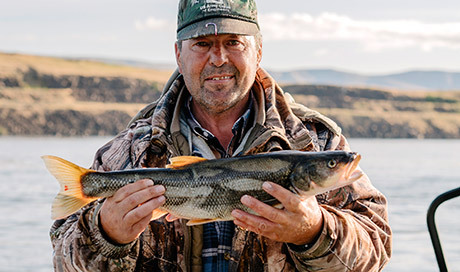 Monday, May 1, marks the beginning of this year's Northern Pikeminnow Sport Reward Program in the Columbia and Snake rivers. BPA sponsors the annual program. State fish and wildlife biologists have specially tagged and released up to 1000 or more northern pikeminnow into the Columbia and Snake rivers, each worth $500. The program also pays registered anglers $5 to $8 per fish, nine inches or longer. The more fish an angler catches, the more each pikeminnow is worth. Last year the top fisherman in the program earned nearly $120,000 in just five-months of fishing. Northern pikeminnow are voracious eaters, consuming millions of young salmon and steelhead each year. Since 1990, anglers paid through the program, have removed more than 4.6 million pikeminnow from the Columbia and Snake rivers. The program has reduced predation on young salmon and steelhead by nearly 40 percent since it began. The 2017 Pikeminnow Sport Reward Program is scheduled to run from now through Aug. 31, 2017. The season could be extended into September based on the availability of funding. The program is administered by the Pacific States Marine Fisheries Commission. For more information about the program call 800-858-9015 or visit www.pikeminnow.org.